Health and beauty retailer, Alliance Boots is about to roll out real time stock visibility to its stores and customers using SAP Hana. Ranjit Gill, delivery director for retail, Boots UK said the real-time view of 25,000 retail lines across 2,500 stores will be live in the next couple of weeks. The stock visibility information will be available to both staff and customers via Boots.com online, the company's mobile app (pictured), as well as through tills, in-store Wi-Fi devices and desktop PCs. Using SAP’s customer activity repository, powered by Hana, the app will also provide Boots employees with an extra view of warehouse stock to improve the delivery chain from suppliers to store. “It will unlock loads of future value and delight customers, while addressing the changing needs of consumers,” said Gill, speaking at an SAP customer event at its headquarters outside London. Gill also said the world of retail has changed, with the recession in 2008 driving a different dynamic in the market. He said consumers have had to become more “savvy” and less loyal to brands to cope with the downturn in the economy. He also noted that, while the recession has now ended, these penny-pinching habits of customers will be far more long lasting and retailers need to use technology to encourage spending. 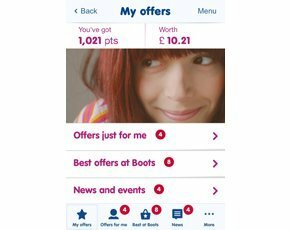 This year Boots launched its mobile app, which links to its loyalty Advantage Card and provides tailored offers to customers via their mobile devices. At its launch, 30,000 offers were viewed in one day. The Advantage Card loyalty programme sits on SAP’s CRM platform, and supports 17 million active card holders. “We have so much information from so much data,” added Gill, who said the company uses this data to be more reactive in order to change promotions, forecast and be more agile to what the customer wants. Boots has a complex IT estate at the customer facing stores, as well as back-of-office functions. “We have had investment going on many years and, with a huge back office, we need to execute and deploy future innovation,” added Gill. The retailer sees 1.2 million transactions a day, across 16,000 tills in 3,100 retail stores. Its website receives one million unique visitors per weeks, which increases four-fold at Christmas, while the IT estate uses around 500 applications to run the business.